I have to say up front that this is purely a personal thing — I know the various series and films have a huge following, and I know that even among Star Trek’s fans there are those who love some shows and hate others (The Next Generation being among the most popular and Enterprise being among the least, as far as I can tell). For me though, the only bit I like at all (and actually like a lot) is one of the films: namely the second film, The Wrath of Khan, itself widely regarded as the best of all the films — those of both the new Star Trek universe, and the old one in which it is set. The problem I have with the show’s later incarnations is that it strikes me as a wasted opportunity — wasted in terms of the world-building and universe creation that the writers could have done. And I think the worst example of that is the portrayal of alien races. Let’s face it, there’s only so much credibility you can stretch by taking clearly human actors and putting facial prosthetics on them, but every time a new race is needed the extent of the writers’ creative effort seems to be “what shape shall we make the ears this time?” Sure, the show has to be filmed without incurring a crippling effects burden every time someone non-human is on screen, but there must be more they can do than what we see. The writers have such an opportunity for world-building with these shows, such a huge arena to let their imaginations run riot and create races as varied and spectacular as they can, but as it is the main alien races seem to consist of nothing more than human actors (and furthermore western, English-speaking actors) wearing sculpted rubber headgear and weird costumes. To avoid labouring the point I’ll jump to what I think is the worst example. 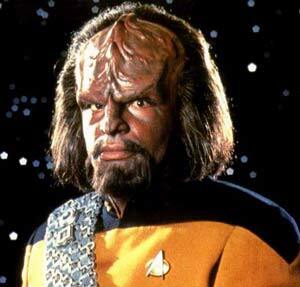 It was one of the episodes of The Next Generation showing the relationship between the Klingon Worf and his son. Klingons at the best of times look like humans with Cornish Pasties strapped to their heads, but all they’d done to represent his son was take a precocious child actor, strap a Cornish Pasty to his head, but make no other moves to instil any alien or otherworldly characteristics to him. Even the dialogue consisted of the kind of “Aw gee dad, can I go in the transporter today?” that you would expect from any stereotypical precocious child. It’s interesting to note that in one of the Next Generation episodes the writers had obviously become aware just how far they were stretching credibility with the plethora of humanoid species and tried to come up with an explanation. They invented an overarching race of super-advanced humanoids which had deliberately seeded Earth, Vulcan, and the Klingon homeworld with modified clones of themselves, having in the process adapted each race’s DNA to not only create the physical differences between them, but also to encode a message in their genes. A message which, we’re expected to believe, not only remained unaltered during the subsequent evolution of each race, but which, when decoded, revealed a 3D holographic projection of one of these super humanoids patiently and helpfully explaining the whole story in English. Add to that the fact that each race in it’s entirety seems to be characterised by just one of the many personality traits which humans exhibit (all Klingons are aggressive, all Vulcans are logical, all Ferengi are cunning, etc) and you’ll see why the world-building fails to inspire me. The pseudo-scientific treatment of the technological aspects of the show is something else which I think falls short. Of course a degree of wild-arsed invention is required when depicting a technological society so far in advance of our own, but there are ways to make it credible and ways that just sound daft. For instance I once saw a documentary showing how the Next Generation writers create the scripts, and one aspect of the process that they seemed particularly proud of was the way all the technical language was inserted into the dialogue. Apparently the actual plot-related content is written by one team, a kind of story team, who just put the word “tech” in the script when something scientific-sounding is needed. Then along comes another team to generate the appropriate techno-babble about Dilithium Crystals or Reversing the Polarity or Gullium Arkenide and the like. They were so proud of this writing method, almost as if it was the best thing since Shakespeare, but for me it looked like more of a failing than something to take pride in. So, as I said at the top, I’m aware Star Trek has its fans, and after all it is just a TV show and a bunch of films so not something to get worked up over. But as a writer of SF myself, and someone who loves wallowing in the products of other writers’ intricate, plausible worldbuilding, I find it hard to raise any enthusiasm when Picard & Co don their lycra to boldly go. I’d rather boldly go to the bookshelf where the likes of Peter F Hamilton and Larry Niven are waiting. I don’t like Star Trek, either, Will. And for pretty much the same reasons as you.